It is hard to believe March has arrived and with it perhaps nicer weather. Our students and teachers continue to work diligently in the classroom. Baseball, softball, and track season is upon us, and rainouts are sure to happen. We will do our best to cancel games and/or practices in a timely fashion to ensure afternoon transportation is not disrupted. Please take a look below for important March dates. 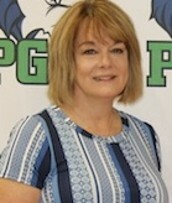 And remember to follow us on Twitter @fssdPGMS, Facebook at https://www.facebook.com/POPLARGROVEMIDDLE/, on Instagram @fssdpgms, and subscribe to our Youtube at https://www.youtube.com/channel/UCzWQ6SIKROxfFbwQgJnA_iQ?view_as=subscriber. 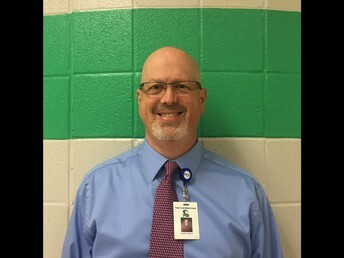 All rising seventh-grade students will need to provide an updated Tennessee Certificate of Immunization prior to your child beginning school in August. The form must be completed, signed and dated by a healthcare provider and show proof of having received the following vaccinations: Tetanus-Diptheria-Pertusis booster (Tdap), and 3 doses of the Hepatitis B vaccine. Your child WILL NOT be able to start school until we have received their required vaccinations and we have documentation of them on a TN Certificate of Immunization. We are unable to accept incomplete forms, or a copy of your child’s immunization record. To avoid any delays, PLAN AHEAD and take care of this now. This season the flu vaccine yielded 61% overall efficacy among ages 6 months to 17 years. This compares to 25% efficacy last year according to the CDC. Currently nationwide the CDC estimates widespread wide spread influenza activity across the majority of the US, including Tennessee. · Follow the rules. Many social sites have an age minimum of 13 for both legal and safety/privacy reasons. Encourage kids to stick with age-appropriate sites. · Tell your kids to think before they post. Remind them that everything can be seen by a vast, invisible audience (otherwise known as friends-of-friends-of-friends). Each family will have different rules, but, for middle school kids, it's a good idea for parents to have access to what their kids are doing online, at least at first, to be sure that what's being posted is appropriate. Parents can help keep kids from doing something they'll regret later. 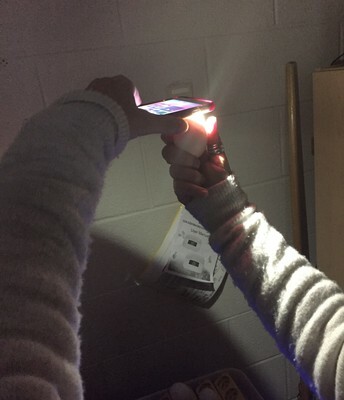 · Make sure kids set their privacy settings. Privacy settings aren't foolproof, but they can be helpful. Take the time to learn about default settings and how to change privacy settings on your kids' favorite sites, and teach your kids how to control their privacy. · Kindness counts. Lots of sites have anonymous applications such as "bathroom walls" or "honesty boxes" that allow users to tell their friends what they think of them. Rule of thumb: If your kids wouldn't say it to someone's face, they shouldn't post it. The students have rallied behind Mrs. Phy with cards and flowers in support of her battle with breast cancer. 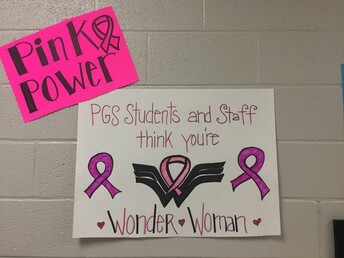 It has been a very trying month, but the 5th grade students have risen to the occasion and are surprising their teachers with their strength, compassion and resilience. We are looking forward to our Science field trip to the Adventure Science Center and Planetarium in March. In Social Studies, students were working on solving an escape room puzzle to help them learn about the ancient Israelites. 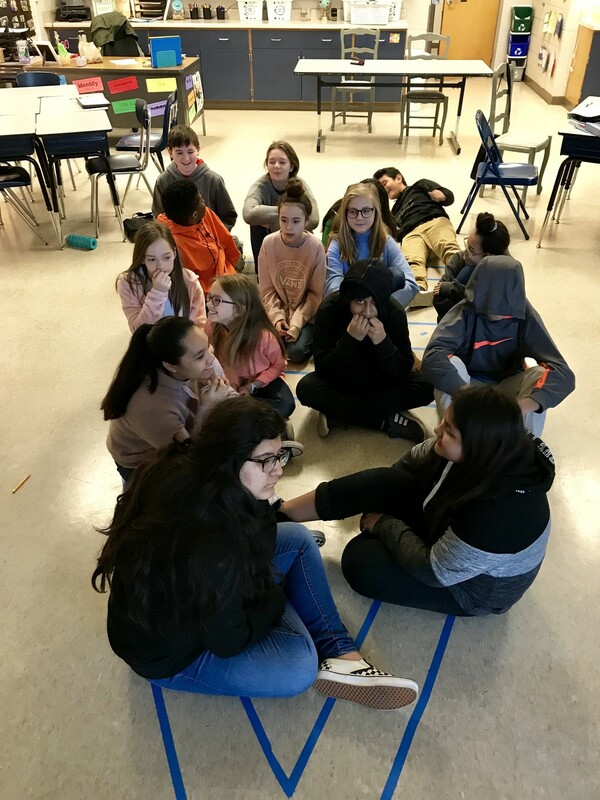 In ELA, students sat inside a "rubber dinghy." The raft is close to the actual size of many of the rafts dozens of Syrian refugees ride in to escape war and persecution occurring in their country. 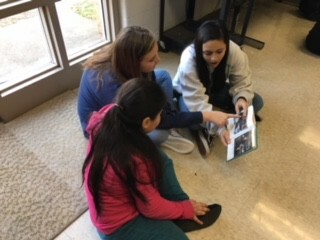 In class, students are continuing to read the novel, Refugee​, and are learning about the experiences that refugees around the world have had to face over the last 80 years in countries like Germany, Cuba, and Syria. 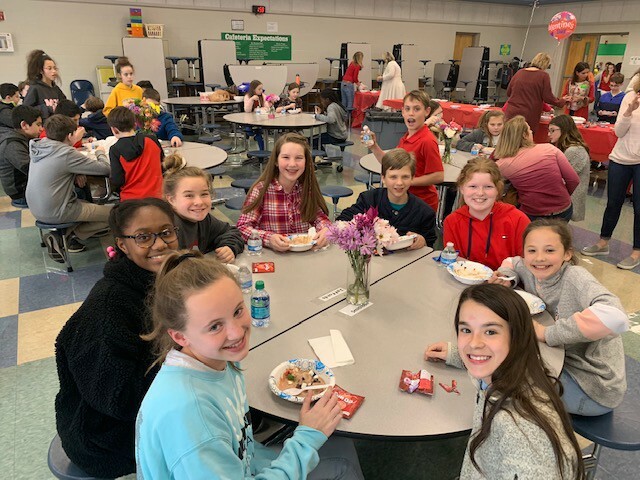 On Valentine's Day, students were able to enjoy a sweet treat, thanks to the hard work of our PTO and Room Parents! 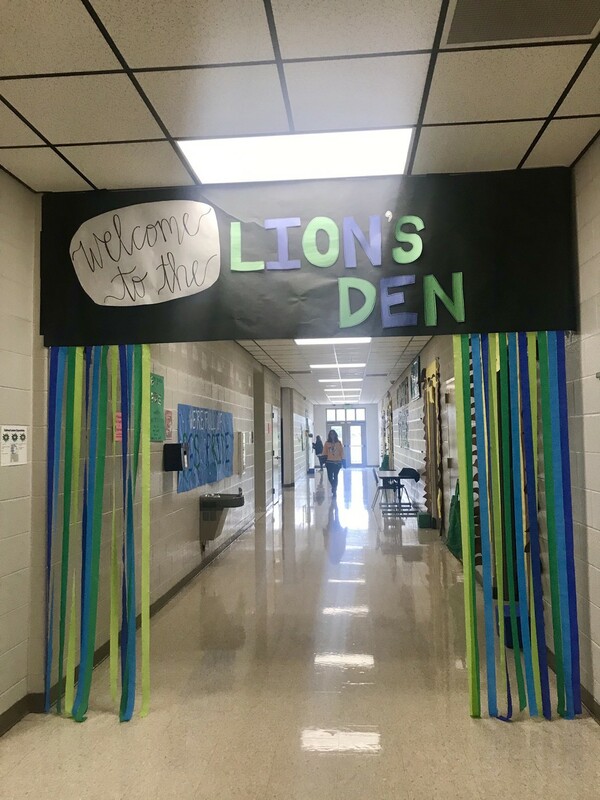 Students also competed in the Homecoming Door Decorating Contest. 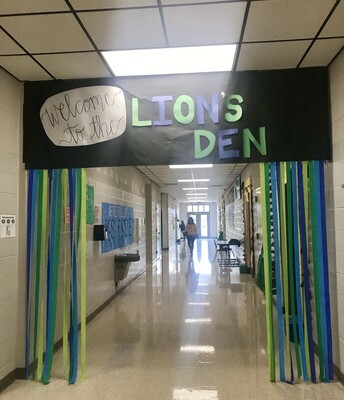 The 6th grade hallway transformed into a lion's den full of pride. Students worked hard to complete their doors! 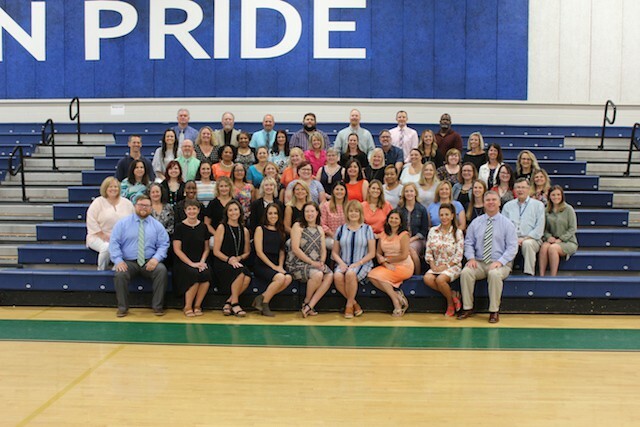 We are "ROARING" with pride!! 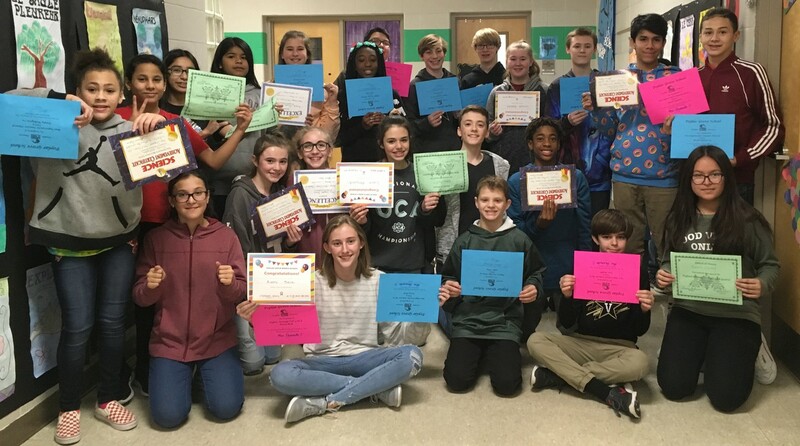 7th grade students that either had the highest average in core classes or were the most improved in core classes for the second quarter received awards. 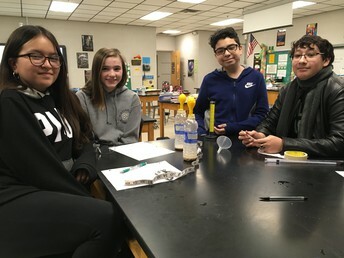 Also, Mrs. Ayers' Science classes have been working on a student-designed experiment on cellular respiration with yeast. The 8th graders have been very exciting about high school registration! Those attending Centennial High School registered last week. Franklin High School will be here March 8 for registration. 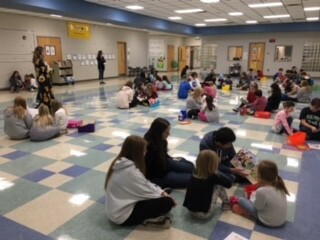 During Read Across America Week, all PGMS students had the opportunity to celebrate reading by partnering with elementary students to read books aloud together. 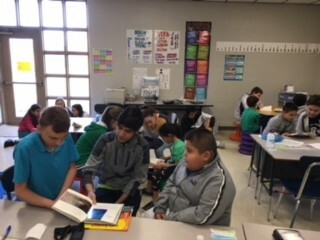 The middle school students did a great job modeling good reading skills and encouraging elementary students with their reading practice. 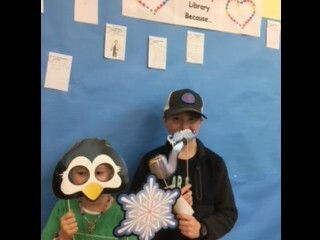 In accordance with Mayor Rogers Anderson's proclaimation that February was Williamson Loves Libraries Month, PGMS students celebrated libraries at a special event at the Williamson County Public Library. 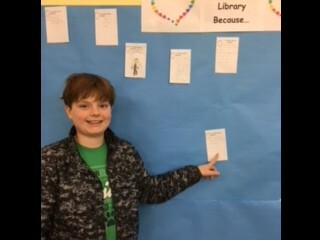 They completed a scavenger hunt to learn more about different areas of the library. 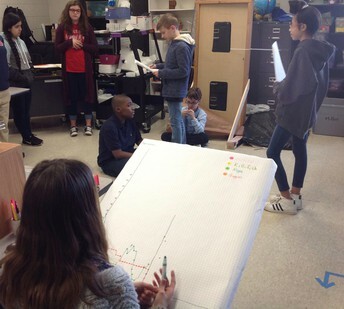 Our 6th grade STEM class simply loves to collect data! 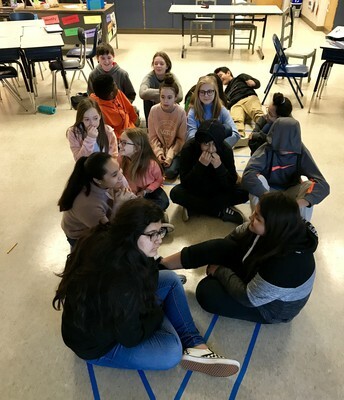 The picture shows students using an embodied model to “act out” an ecosystem including guppies, killifish, cichlids, and algae. Each student is “programmed” as one of the aforementioned fish/plant. A line chart is being created by hand to show the changes in the ecosystem as fish/plant gains and loses energy. 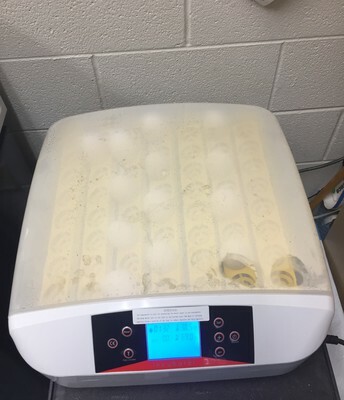 Next, we create computational models on our Chromebooks and program the guppies, killifish, cichlids, and algae. 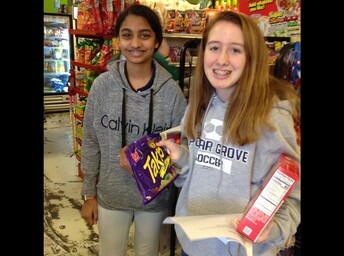 Both 7th and 8th grade Spanish students took a field trip to Los Primos Market in Franklin. Students practiced their Spanish in the real world. This was a wonderful and enriching experience for students to speak Spanish and taste authentic foods. A great time was had by all! Our next project is set for February 28th. Thanks for your supports parents! Our PGMS TECHFIT finalists are at it again! 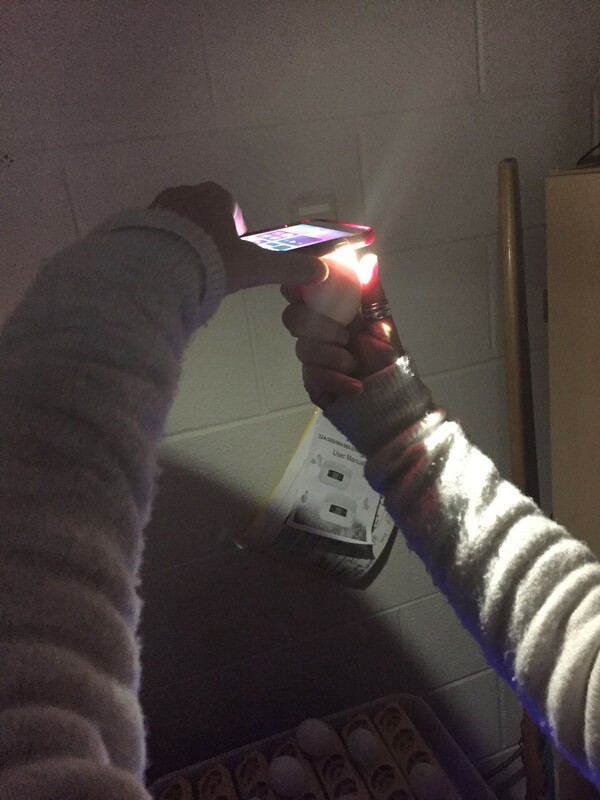 We are excited to showcase our exergame during Friday’s advisory challenge on March 1 @ 2PM. The last four advisories complete our escape room and the house with the fastest time wins! 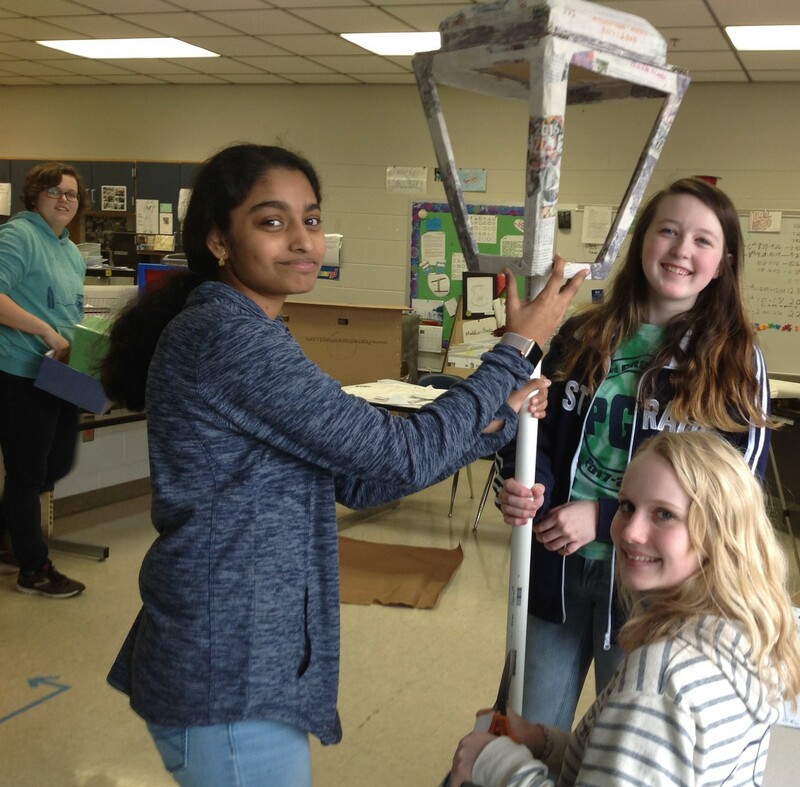 Our PGMS TECHFIT students have been stepping through the engineering process again and have made some exciting improvements! Reverentum is still in the lead with 9,584 points. Almitas is second with 8,945 points. Coraticus has 7,650 and Sapenta has 6,846 points. 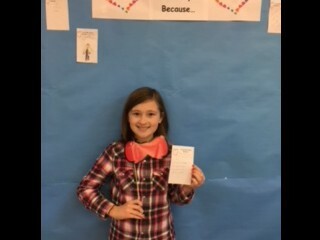 For this 9-weeks our school is highlighting the character trait of RESPECT. We as a school believe that respecting each individual student and all staff members is extremely important. So, for our PBS parent tip for this month’s Poplar Grove Post, we want to encourage each family to have at least one discussion at family dinner, or in the car, about how to show respect to others at school this week. Finally, many classrooms have a need for some particular supplies. If you are able, please consider donating some pencils and/or Clorox wipes to your child’s grade level team. 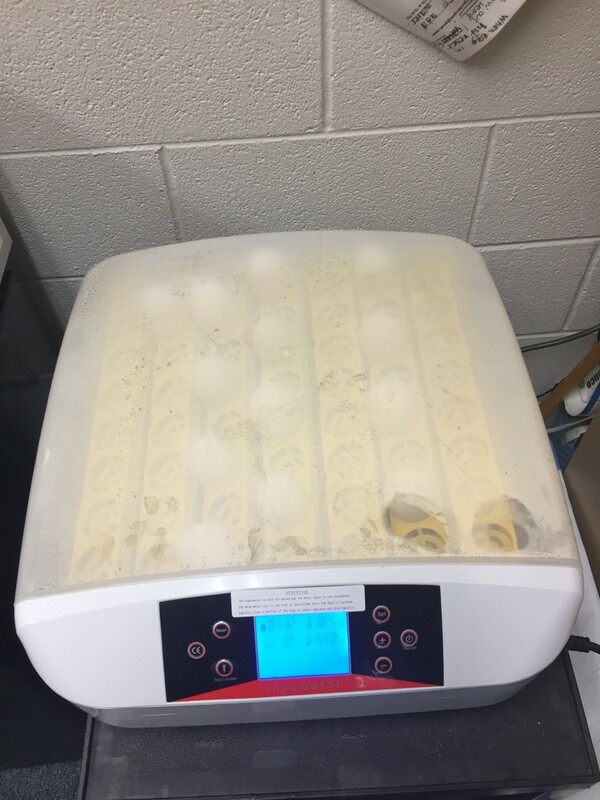 Thanks for helping make Poplar Grove a great place for students to learn and grow! Any rising Freshman interested in trying out for the CHS Dance Team: There will be a parent meeting on Tuesday, March 5, at 6:00 pm in the Media Center. The dance clinic and tryouts are March 13-15, 3:00-5:00 pm. Contact natalie.coffin@wcs.edu for more information. Tryouts for PGS Competition Cheer will be Friday, April 5th. This is open to any rising 5th, 6th, 7th, or 8th grader. Packets are available in the middle school office. The clinic will be April 1st, 2nd, and 4th. There will be a mandatory parent meeting on Tuesday, March 12, at 5:30 pm for those interested in trying out. 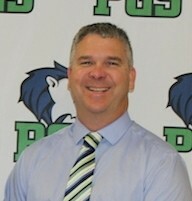 Please see Coach Brennan for more information. Please join us for fun with family, friends, and FOOD!